Am I Dreaming of Summer? Open Wide and Say "EEEE"
I finally finished weaving in all the ends on my sweater and sewed on the buttons. 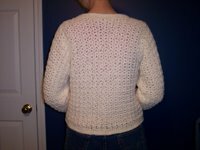 I used a free pattern from Kim Guzman (CrochetKim). The pattern is called Adult Jiffy Jacket and is available here. I used vanilla TLC Amoré, a yarn I've used for several items and really like. The pattern was easy to follow, and she includes good diagrams and measurements of the pieces. I made the small size with a few adjustments: I made the sleeves longer and shortened the length of the cardigan. But otherwise I followed the diagrams and the given measurements. I still have not succeeded in making a sweater I'll wear in public, but this one is awfully close. Its main problem is it is just too big for me. It fits okay around the chest and across the shoulders, but the waist area is too big and the upper sleeves are just huge on me. In the photos, I've pulled the sweater together in the back so it looks better, but of course I can't actually wear it like that. 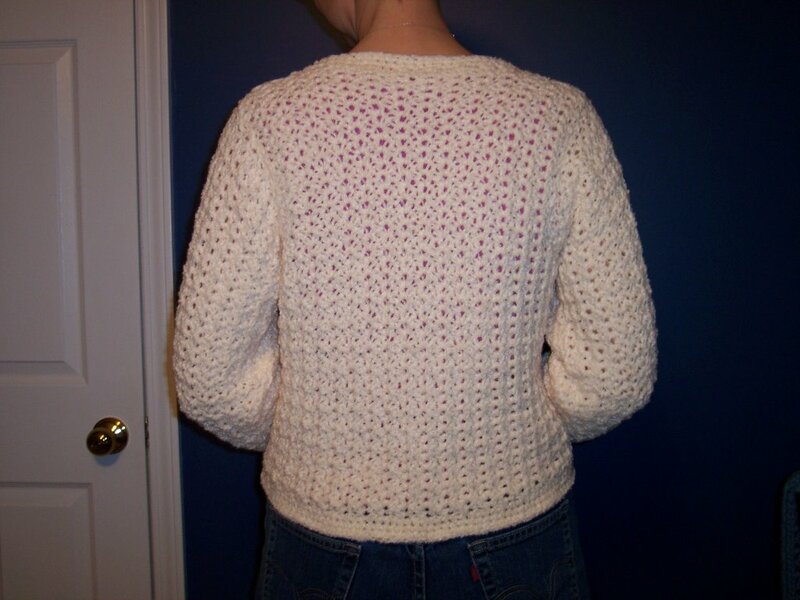 I'd like to make this sweater again, but I'd have to adjust the measurements to fit me better. But this would be fairly easy to do because of the great diagrams and measurements Kim included. Diagrams and measurements really help a lot. I wish all clothing patterns would include them. I won't even attempt a pattern that doesn't. How can you know if you're making it correctly if you don't know what the pieces are supposed to look like? And how can you alter it to fit your own measurements? I really like the TLC Amoré, except when it comes to sewing pieces together. This yarn just is not well suited for that. After a few inches of sewing, the yarn begins to shred and unravel at the ends. All yarns display this characteristic to some degree, of course, but this yarn wears out sooner than others do. This means that instead of using short lengths of yarn for sewing, you have to use really short lengths, which means lots more ends to weave in when you're finished assembling everything. And I hate weaving in ends. I'd still like a sweater made of this yarn, but I think I'll have to make a top-down raglan sweater with no assembly required. Time to turn to Janis Cortese and her excellent "General Guidelines for a Basic Sweater" (here), which includes instructions for both crocheting and knitting, and Pamela Costello's "The Incredible, Custom-fit Raglan Sweater" (here), which is for knitters but can be easily adapted for crocheting, especially if you read Janis's page first. But first I'm going to make that afghan I mentioned the other day. This will be the "Great for Your Guy Afghan," which I've made a couple of times before. I posted an entry about it last year, which you can read here. I'll be using Red Heart Super Saver in linen and aran. Thanks for sharing. 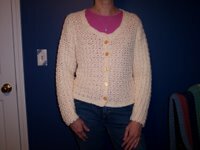 I am looking for a good cardigan pattern. This one looks like it will work. I agree that the upper sleeves are too big. But, the sides look okay. I can see how you might want it to be a bit more tapered. Nice! I'm glad you enjoyed the design! Would you mind if I posted a photo in a photo gallery I am thinking about making on my website (with a link to your blog, of course). Kim, that would be fine with me! Hi, Lisa! I finally got a Photo Gallery set up and you're there. I have tip too. I know how difficult it is to sew together things made in TLC Amore. So, I decided to crochet them together instead. I just made the slip stitches pretty loose so it wouldn't bulk up. But, it worked really well. Thanks for the tip, Kim. And your photo gallery looks great!